ENSENADA, Baja California, Mexico—Patience and fortitude along with a trusty steed carried Las Vegas’ iconic Hall of Fame desert racer Rob MacCachren to his second straight overall SCORE win Saturday as won the golden anniversary celebration of the 50th BFGoodrich Tires SCORE Baja 500 in dynamic fashion by starting first, never losing the physical lead and finishing first in the elapsed-time race. Round 2 of the four-race 2018 SCORE World Desert Championship was held this past week in Mexico’s Baja California, starting and finishing in Ensenada, the seaside port on the Pacific Ocean, 80 miles south of San Diego. Race title sponsor BFGoodrich Tires also paid a US$25,000 contingency bonus to MaCachren for his overall victory to help commemorate this year’s race. He earned the 32nd overall 4-wheel victory for his tire sponsor BFGoodrich Tires in this race. Starting first and never passed while defeating a strong field of 321 starters including 33 in the marquee racing division for high-tech, 900-horsepower, unlimited custom trucks, MacCachren, 53, drove to victory over a tremendously tough 542.12-mile race course, finishing in his trusty warhorse– No. 11 Rockstar Energy MacCachren Motorsports Ford F-150 (built by Geiser Bros of Phoenix) in a penalty-free 11 hours, 21 minutes, 15 seconds, averaging 47.75 miles per hour. MacCachren earned a victory margin of three minutes, 32 seconds over Luke McMillin, 25 of San Diego, who finished second overall in 11:24:47 at 47.50 mph in the No. 83 Mark Racing Ford F-150. For MacCachren it was his sixth class win and second overall triumph in the SCORE Baja 500 as he increased his SCORE-record total of career SCORE Trophy Truck race wins to 17. While finishing second three times in this race by less than four minutes total, including a seven-second loss to Las Vegas’ B.J. Baldwin in 2008, MacCachren’s first overall win here came in 1996 when he was racing for the powerful BFGoodrich Tires Rough Rider team in SCORE Trophy Truck. Improving on his fifth place finish in San Felipe Ryan Arciero, 44, Lake Forest, Calif., deftly drove himself to the final spot on the podium with a third-place overall and SCORE Trophy Truck finish in his No. 32 Ford F-150 in 11:29:06 while averaging 47.20 mph. For the second straight SCORE race, San Diego’s legendary McMillin family had three third-generation desert racers with top finishes. After third, fourth and sixth place finishes in San Felipe, the McMillins had second, fourth and fifth place finishes in the SCORE Baja 500. While Luke finished in second place his brother Dan McMillin, 30, teamed with desert racing legend Larry Roeseler, 61 of Imperial, Calif., to finish fourth in the No. 23 Mark Racing Ford F-150 in 11:29:40 (47.16mph). The McMilin-brothers’ cousin Andy McMillin, 31, finished fifth overall and in SCORE Trophy Truck in the new No. 31 McMillin Racing Chevy Silverado with a time of 11:30:53, averaging 47.08mph. The first time for the McMillin family to finish three SCORE Trophy Trucks in the top five overall and in class, the first and second generation McMillin racers did it first in the 1981 SCORE Baja 1000 when the won three classes while finishing in the top five overall. Mark McMillin, Dan and Luke’s dad, finished first overall and in Class 1, late family patriarch Corky McMillin finished second overall and won Class 2 and Scott McMillin, Andy’s father, finished fourth overall while winning Class 10. When the race course officially closed on Sunday morning at 8:28 a.m., 187 of 321 starters (58.26 percent) completed the radically rugged course within the 22-hour time limit to earn their coveted official finisher medals and status. Both the start and finish line were located once again in the heart of Ensenada on Boulevard Costero adjacent to the historic Riviera del Pacifico Cultural Center. With the 321 official starters being a solid eighth-most in the 50-year history of this great race., U.S. racers among the field ranged from Alaska, Hawaii, California, Washington and Oregon in the Pacific West, Nevada, Idaho, Arizona, Utah, Montana, Wyoming, Colorado and New Mexico in the Mountain West, New York, New Jersey, Rhode Island and Connecticut in the Northeast, Illinois, Ohio, South Dakota, Kansas and Texas in the Midwest and Florida, Louisiana, North Carolina, Tennessee and Virginia in the South. In addition to 32 U.S. States, racers came from 14 total countries. In addition to the USA, U.S. Territories Guam and Puerto Rico, racers came from Host Mexico, Andorra, Argentina, Austria, Canada, Finland, Germany, Italy, Japan, New Zealand, Peru and Spain. For the second straight race, Justin Davis, Chino Hills, Calif., captured the unlimited Class 1 while finishing 12th overall in the No. 185 Green Army Motorsports Chevy-powered Jimco open-wheel desert race car. His winning effort was completed in 12:25:39 (43.62mph. He defeated 12 starters in his class. Starting first he never looked back and finished with a victory margin of over 45 minutes. Riding the No. 7x Honda CRF450X, Justin Morgan, 25, El Cajon, Calif. and his three-rider team raced to the overall motorcycle victory for his third overall motorcycle win in this race in the last four years. Repeating their SCORE San Felipe 250 win earlier this year, they crossed the finish line in 11:54:58 at an average speed of 45.49mph. Morgan split the riding with Mark Samuels, Yucca Valley, Calif. who won his second overall moto title in this race in three years and Justin Jones, Murrieta, Calif. who won his first SCORE overall moto title in this race. Pulling off a major upset by winning over a SCORE-record field of 35 starters in Pro UTV FI, 13 starters in Pro UTV and three starters in Pro UTV Unlimited, Kristen Matlock was the overall UTV winner and Pro UTV NA (Normally Aspirated) class winner in the race. Matlock, 37, of Alpine, Calif., drove solo in Pro UTV NAto a winning time of 14:26:47 in a Polaris RZR XP4 1000 for a victory margin of over 31 minutes over the second place finisher among all 51 of the Pro UTVs that started the race. A veteran competitor in her class and winner of the season opener in San Felipe, Matlock’s victory was even more impressive by the fact that she defeated all of the normally-faster Forced Induction UTVs as well. Keeping things in the family, her husband Wayne Matlock, 40, finished second in the higher-powered Pro UTV FI class in a Polaris RZR XP4 Turbo. The married couple both won their respective classes in the season-opening SCORE San Felipe 250 in early April. Eleven of the top 12 overall finishers in the race were from the marquee SCORE Trophy Truck class. The one that wasn’t from SCORE Trophy Truck was Davis from Class 1. Finishing sixth overall and in SCORE Trophy Truck was three-time defending SCORE Trophy Truck season point champion Carlos ‘Apdaly’ Lopez, Tecate, Mexico, in 11:52:36 in the No. 1 RPM Racing Chevy Rally Truck and seventh was Billy Wilson, Corpus Christi, Texas in the No. 15 Bevly/Wilson Racing Ford Raptor with a time of 11:56:43. Eighth and ninth overall and in SCORE Trophy Truck we the three Herbst brothers of Las Vegas racing in twin Monster Energy Terrible Herbst Motorsports Ford F-150 SCORE Trophy Truck. Troy Herbst, racing with Christian Sourapas, Rancho Santa Fe finished in 12:01:41 in the No. 19 truck and his older brothers Tim and Ed Herbst finished 40 second behind Troy in 12:01:51. Former NASCAR team owner/driver Robby Gordon, Charlotte, N.C. was 10th overall in his No. 77 Speed Energy Team Gordon Chevy Silverado in 12:08:39 and 11th was brothers Alan Ampudia/Aaron Ampudia, Ensenada, Mexico in their No. 10 Papas Y Beer Racing Ford F-150 in 12:08:43. 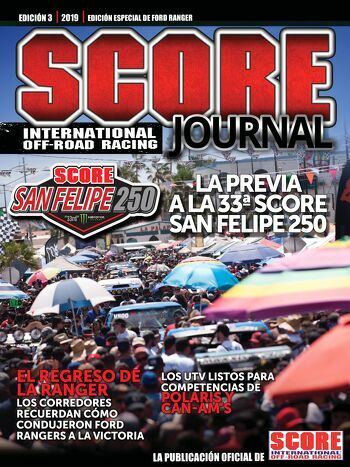 In addition to MacCachren (SCORE Trophy Truck), Davis (Class 1 and Kristen Matlock (Pro UTV), Morgan, five other racers remain undefeated after winning here at the SCORE Baja 500 following their class wins at the season-opener in San Felipe. In the car, truck classes, also winning for the second straight race were Vincent Munoz, Yucaipa, Calif. (Class 8, Ford Ranger) and Jesus Mendez Jr, Mexicali, Mexico (Pro UTV Unlimited, Can-Am X3). Also winning for the second time were Giovanni Spinali, El Cajon, Calif., in Pro Moto 50 on a Honda CRF450X, Francisco Septien, Ensenada, Mexico in the Pro Ironman motorcycle class on a Honda CRF450X and Canada’s Guy Laycraft in Pro Moto 60 on a Honda CRF450X. Among the racers earning their first class wins in the 2018 SCORE World Desert Championship at the 50th BFGoodrich Tires SCORE Baja 500 were Gustavo Vildosola Sr, Mexicali, Mexico (SCORE TT Legend, Ford Raptor), Bryce Swaim, El Cajon, Calif. (Trophy Truck Spec, TSCO-Chevy), Broc Dickerson, Brawley, Calif. (Class 10, Alumi Craft-Chevy), Casey Currie, Norco, Calif. (Hammer Truck Unlimited, Jeep Wrangler), Oscar Alvarez, McAllen, Texas (Class 1/2-1600, Romo-VW), Gustavo Pinuelas Jr, Mexicali, Mexico (SCORE Lites, Jimco-VW), Jeff Proctor, Glendora, Calif. (Class 7, Honda Ridgeline), Mark McNeil, El Cajon, Calif. (Class 5, VW Baja Bug), Branden Sims, Prescott Valley, Ariz. (Pro UTV, Polaris RZR XP Turbo), Peter Alesi Jr, Alpine, Calif. (Vintage Trailblazer, Chenowth-VW), Viry Felix, Ensenada, Mexico (Class 11, VW Sedan) and David Heredia, Hacienda Heights, Calif (Class 5/1600, VW Baja Bug). Two 2017 season class champions who won for the first time this year were motorcycle class racer Ryan Liebelt, Reedley, Calif. (Pro Moto 30, Yamaha WR450F). Winning for the first time this year in Pro Quad was Said Sanchez, Tijuana, Mexico on a Honda TRX450R. With points allotted to the driver/rider of record who must start and/or finish the race, it’s not uncommon to see a racer on two entries, or occasionally on three entries, but Mexico’s Santiago Creel took it to an entirely new level. Creel, 31, an international motorcycle rally racer from Mexico City, was rider of record on four motorcycle entries in three classes and an additional driver for Mark Winkelman, Cedar Hills, Texas, in a new Trophy Truck Spec vehicle. Riding on various KTM motorcycles, Creel had rider of record on two vehicles in the Pro Moto Unlimited Class, one in the Pro Moto Limited and the fourth one in the Pro Moto 30 class for riders over 30 years old. At the season opener in San Felipe, his teams won both the Pro Moto Limited and Pro Moto 30 classes and finished second and third in Pro Moto Unlimited. In Saturday’s race, Creel was second in both Pro Moto Limited and Pro Moto 30, and his KTMs in Pro Moto Unlimited finished fifth and a did not finish and the Trophy Truck Spec did not finish as well. The Golden Anniversary course, designed and finalized by SCORE Race Director Jose A. Grijalva was an astounding race-record 542.12 miles, running in a clockwise direction. Starting and finishing once again in the heart of Ensenada in front of the Riviera del Pacifico Cultural Center, it quickly left the pavement and head up the spectator-friendly Ensenada Arroyo for two miles as it headed out of town. Upwards of 50,000 spectators watched the race in that area alone. And local tourism officials estimated upwards of 200,000 fans spread along the entire length of the grueling race course. The historic race course was another memorable example of all that Mexico’s Baja California has to offer, including high-speed dirt trails, sandy, rocky and silty natural terrain, majestic Baja washes and canyons, stretches along the seashore with elevations from sea level to over 3,000 feet. The course was another jewel reflecting the mesmerizing, stark beauty of Baja California. This year’s Golden Anniversary course had four physical checkpoints—Checkpoint No. 1-El Chinero, (Race Mile 174.20), Checkpoint No. 2-San Matias (RM 260.72), Checkpoint No. 3-Vicente Guerrero (RM 368.15) and Checkpoint No. 4-Santo Tomas (RM 466.83). Legendary Hall of Fame former SCORE owner Sal Fish joined Hall of Fame retired racer Ivan Stewart as co-Grand Marshals for the 50th BFGoodrich Tires SCORE Baja 500. Fish, the ‘godfather’ of desert racing who ran SCORE from its Baja start in 1974 for 39 years through the end of the 2012 season joins the iconic ‘Ironman’ Stewart, who has 17 class wins (including an incomparable 10 4-wheel vehicle overalls) in the SCORE Baja 500, shared duties for the special golden anniversary race that they both have been such a major part of over the years. Fish turned 79 on May 2 and Stewart will turn 73 on Monday. This year was the 45th time the race it started and 41st time it finished in Ensenada, the off-road capital of the world. Below is the four-race 2018 SCORE World Desert Championship schedule. For the third consecutive year all four races are being held in Baja California, Mexico.